I really wanted to do a clever name today. Something like "Soundtrack-Sunday's" or "First-try-Friday's. Unfortunately today is Friday, I have no first try's, and I felt like writing an opinion piece about things that have been going on around me as of late. preview/download a song, seriously. Seriously, check it out. 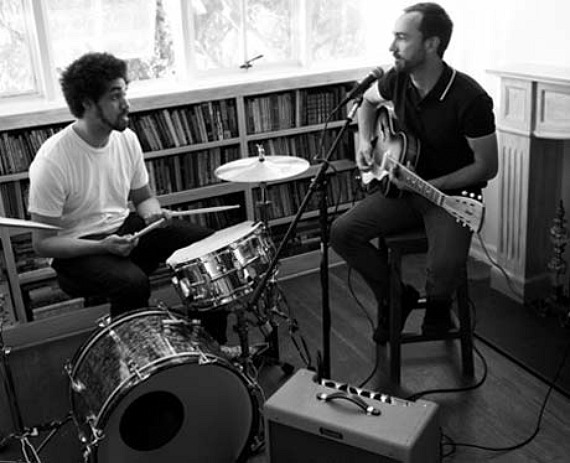 Brian Burton (Dangermouse) and James Mercer (The Shins) making sweet music. 2. I am petrified of the basement in my building. That's right I'm scared of basements (and also of the dark if anyone is keeping track). Our laundry machine is in the basement. Every time I am down there I vividly replay scenes from Paranormal Activity in my head, that movie has scarred me for life. Thanks a lot Jess, Taylor, and Nate. I hold you three accountable for my (now) life long fear of basements- I suffer from basementaphobia. Awesome. 3. I walked through Ottawa U campus the other day and was reminded of something I loath: denim skirts and uggs. Its not cute, its not steezy, it is not really appropriate university/classroom attire- and it is definitely not dinner, dancing, or partying attire. Put the Abercrombie/American Eagle/ Holister skirt down. Please. Next up Crocks, Rachel I'm sorry. I am not the first one to say it, and I definitly will not be the last- just no. The fact that Crocks came out with different "models" does not solidify them as an urban shoe company, take them back to the garden where they belong. 3. Mother Nature, good on ya for turning the weather around, though I could do without the facebook status' and tweets letting everyone know how nice it is outside... I think we are all vaguely aware of that fact. But, lets be honest, I have updated and tweeted much less informative posts during my online existence. I do hope to be joining the masses, sitting on a patio sipping a Caesar in the sun at some point this weekend. 5. Car Parties (i.e road trips) back to Toronto with the sun shinning, friends, and The Roots, Passion Pit, Pheonix, and Led Zeppelin doin' his thang make for a fairly positive experience. I probably should not admit that this was my first real Led Zeppelin experience... yes I live under a fairly selective rock, and ya I am okay with it. 6. Alright, last one. hot yoga. wow... that is really all I have to say.